Try it. Love it. New Size-it is here. The UK's leading professional water heater sizing tool is now more user-friendly and informative than ever before. It's quick, personalised and available online on any device, any time. Designed with your needs in mind, you can manage a portfolio of projects and tailor the sizing to your exact property requirements. Its comprehensive database allows you to select the different parts that make up your property type and hot water requirements. 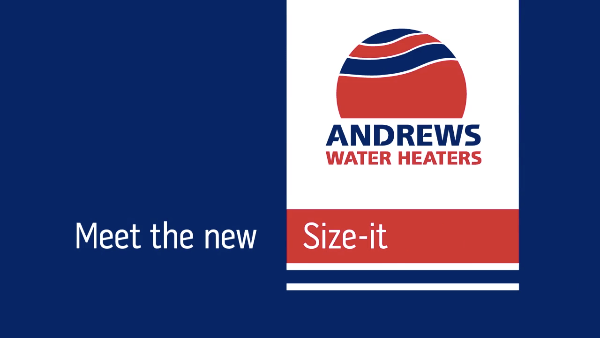 Size-it will then recommend the most suitable Andrews Water Heaters product for your job, along with a detailed summary report and all the technical and up-to-the-minute legislative information required to complete a hot water schedule. Find out more about why you should use Size-it for your next project here.